A derelict century-old wharf shed in Cairns is transformed into the state-of-the-art, multi-purpose Cruise Liner Terminal (CLT), function and exhibition space. 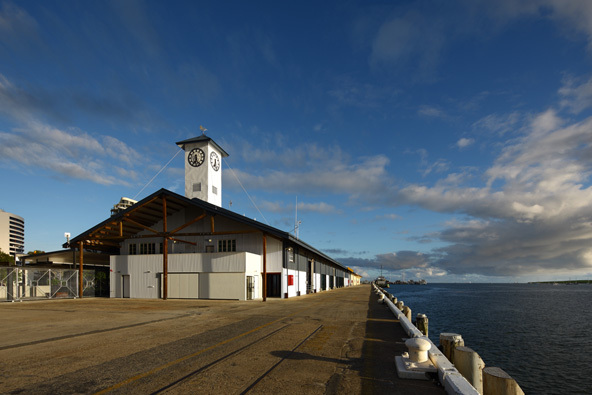 Wharf Shed 3 was built in 1914 to service port operations at the Cairns wharf precinct and appeared destined for demolition, having been abandoned since the 1960s. However, good fortune intervened when it was selected to become the city’s new Cruise Liner Terminal (CLT) – part of a $40 million state funded urban renewal project. The brief was to refurbish the building in a manner “respectful to the heritage fabric” – transforming the shed into a state-of-the-art multipurpose exhibition and function space to be used when cruise liners were not in port. One of the most impressive elements of the original structure were its damaged, but still structurally sound, central columns of brown penda – an extremely hard Queensland species. Other timber features of mainly Queensland maple and silky oak have also survived – despite the best efforts of regular cyclones through the region. A century ago, buildings in Australia’s Far North buildings were designed to be ‘held up’. But as the architectural joint venture project leader Roger Mainwood (TPG) says, now the engineering is all about holding structures down. “When we started on the shed there was very little ‘hold-down’ because connections weren’t heavy enough and the Queensland maple and silky oak purlins offered limited structural capacity. So the new roof structure includes steel double rafters – providing most of the bracing for the whole shed. The heritage process required preservation and restoration of as much original corrugated iron fabric as possible. Rusted areas, mainly on the see-ward side, were replaced with windows – revealing some of the original timber cross bracing and girts to the outside, and providing great views from inside. “We wanted to retain that original character, so we put a new steel layer like a tent fly over the original building,” says Arkhefield architect Karen Ognibene. Wood products include: brown penda (columns), Queensland maple (trusses/doors), silky oak (doors/purlins), New Guinea rosewood (bi-fold doors), spotted gum (decking, seats, battens). All material replacement was done with like-for-like materials, including new girts from recycled wharf timbers salvaged from other Cairns wharf sheds. New materials are sympathetic to the heritage fabric, but clearly distinguishable. Within its skin of old corrugated iron and the intricate hardwood frame, the new terminal building retains the same philosophy of trestle tables and a rudimentary immigration experience for cruise liner passengers. Some of the stories of Shed 3’s colourful history – including a starring role in the original South Pacific movie – are referenced in wall murals and retained artefacts, including old signs and wharf workers’ handwritten notes on the walls. Perhaps the biggest challenge was to find a way for visitors to experience the iconic clock tower (circa 1948) on the southern end – but from inside the building. The creative solution involves a digitally reproduced projection of the beautifully crafted clock face, showing actual time, on to the floor at the base of the tower. A sensitive redevelopment of this historic rural property (est.1841) results in a function venue with a simple and striking palette of materials. The adaptive reuse of the property reconnects the site with the community.